There are 4 main chemical bonds: ionic, covalent, polar and hydrogen bond. Electronegativity is the property of an atom to attract a shared pair of electrons (or electron density) towards itself. A covalent bond involves the sharing of electrons between two atoms. In a polar bond, the two atoms connected by a covalent bond attract the shared electrons with different strength, producing an unevenly distributed charge. A ionic bond involves a transfer of an electron between two atoms: one atom gains an electron while one atom loses an electron. Consequently, one of the resulting ions carries a negative charge (anion), and the other ion carries a positive charge (cation) and, as opposite charges attract, the two atoms bond together to form a molecule. This type of bonding is based on the electrostatic force of attraction between the ions in the molecule. Ionic bonds are only formed between metals and non-metals. NaCl, table salt, is a clear and simple example of an ionic bond. Sodium is in group one of the periodic table of the elements and has one electron in its outer shell. Chlorine, on the other hand, is in group 7 of the periodic table and has 7 electrons in its outer shell. When these two elements react together, the sodium gets rid of the only electron in its outer shell, thus the sodium atom will have its second most outer shell which is full (before losing the electron) become the outer shell that forms a positive ion. The electron lost by the sodium atom is gained by the chlorine atom and added to the 7 electrons in outer shells, filling it and becoming a negative ion. This electron transfer causes the electrostatic force of attraction which holds the oppositely charged ions together in a molecule. When an atom becomes an ion, it acquires the properties of the noble gas which is nearest to it in the periodic table, therefore becomes very stable. Fig 1. Ionic bond between Na+ and Cl- to form NaCl. This is the most common bond in organic chemistry and involves the sharing of electrons between two atoms, rather than a transfer. The pair of shared electrons forms a new orbit that extends around the nuclei of both atoms, producing a molecule. Atoms will covalently bond with each other in order to gain more stability, which is gained by forming a full electron shell. Therefore, by sharing their outer electrons, atoms can fill up their outer electron shell and gain stability. To understand how and why the covalent bonds are formed, we need to talk about the octet rule. The Octet Rule requires all atoms in a molecule to have 8 valence electrons to become stable. Atoms can do so by sharing, losing or gain electrons in a chemical bond. As we said above, in covalent bond atoms share their electrons with each other to satisfy the Octet Rule. 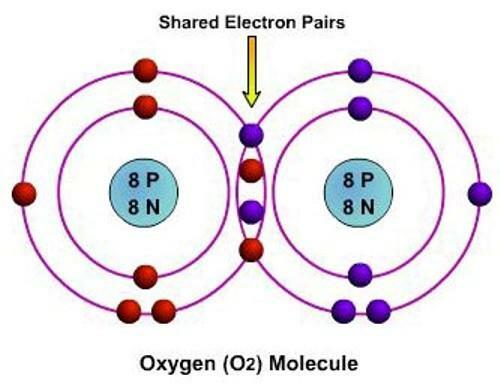 The reason why it requires 8 electrons is that that is the number of electrons needed to fill a s- and p- orbital (electron configuration) also known as a noble gas configuration. Each atom wants to become as stable as the noble gases that have their outer valence shell filled because noble gases have a charge of 0. There are two secondary types of covalent bonds that are relevant to biology — polar bonds and hydrogen bonds. Fig2: An example of a covalent bond between two atoms of O to form a molecule of oxygen. Before defining the polar bond, it is useful to get familiar with the concept of electronegativity. Electronegativity is the tendency of an atom to attract electrons in the formation of a bond. It was defined by the scientists Pauling and therefore, The Pauling scale is the most commonly used. Fluorine (the most electronegative element) is assigned a value of 4.0, and values range down to caesium and francium which are the least electronegative at 0.7. Polar bond is a type of covalent bond where two atoms connected by a covalent bond have a significant difference in electronegativity and attract the shared electrons with different strength, producing an unevenly distributed charge. 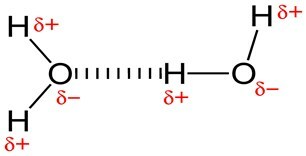 This type of bond can be seen as an intermediate case between ionic and covalent bonding, with one end of the molecule carrying a partial negative charge and the other end a partial positive charged. These slight imbalances in charge distribution are indicated in the figure by lowercase delta symbols with a charge superscript (+ or –). Water is an example of a polar molecule; the oxygen is far more electronegative than the hydrogen, so attracts the shared electrons towards itself, producing a partial negative charge around its orbitals, and the hydrogens end with a partial positive charge around them. This state is also called polarity of the water, and explains why some substances dissolve readily in water and others do not. Fig 3. graphicrepresentation of the polar bond in the molecule of water. Note the partial negative and positive charges indicated by the symbol delta. This type of bond is very important in water and plays a central role in the process of aqueous solutions. 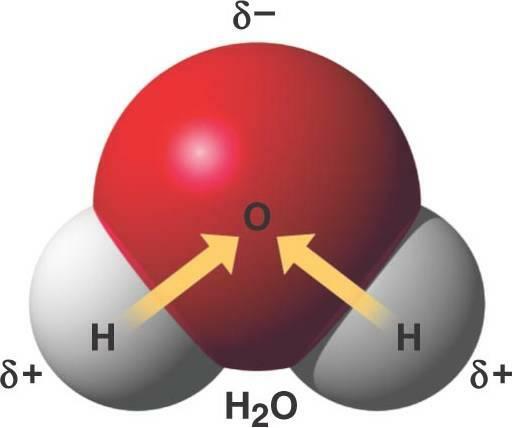 Two adjacent H2O (water) molecules can form a bond known as a hydrogen bond, where the (electronegative) hydrogen atom of one H2O molecule is electrostatically attracted to the (electropositive) oxygen atom of an adjacent water molecule. This is a weak bond and is more like a linkage than a bond itself, in fact, hydrogen bonds have only about 1/20 the strength of a covalent bond. Molecules of water join together transiently in a hydrogen-bonded lattice, and although a single hydrogen bond is a weak bond, this force is sufficient to affect the structure of water, producing many of its unique properties, such as high surface tension. Hydrogen bonds are important in many life processes, such as in replication and defining the shape of DNA molecules and proteins. Fig 4.Hydrogen bond between two molecules of water.